It helps in the digestion of food by delivering strong digestive enzymes into the small intestine. The pancreas discharges two hormones into the bloodstream: glucagon and insulin. They aid in the way the body derives energy from its food source. If the pancreas becomes inflamed, it is pancreatitis. 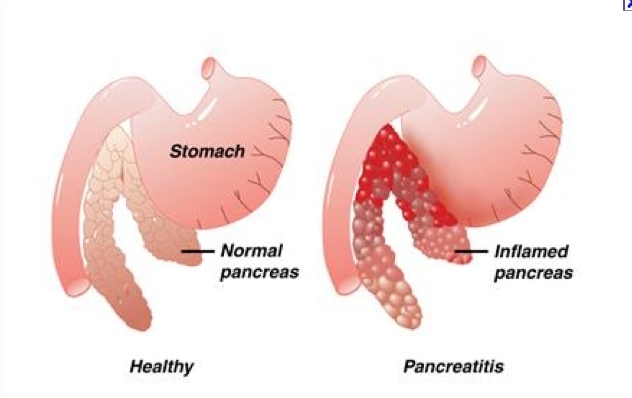 When the enzymes used for digestion are activated before they are delivered to the small intestine and it attacks the pancreas it results in pancreatic damage. There are two types of pancreatitis, chronic and acute; the symptoms are very different from each other. If you think you may have pancreatitis, it is important to find out which one you have so you are treated accordingly. If you have acute pancreatitis the unexpected inflammation may only persist for a short period. The illness could show up as a little discomfort up to a serious illness that could be life threatening. The recovery rate for those with acute pancreatitis is good if treatment is sought right away. If the case is more serious it could end up in severe damage to the tissue, bleeding right into the gland and formation of a cyst. Additional damage could affect the kidneys, lungs, and heart. Pain is a common symptom and it can either build slowly or show up out of the blue. If it comes on suddenly, it is usually harsh. Gradual pain could start out slowly but quickly becomes serious. The location of the pain can be found mostly in the abdomen on the left side in the middle or upper left area. Patients feel as if the pain is coming from the front of the belly to the back. It may become start up or get worse after you eat. Feelings of pain usually go on for a couple of days. If you lie on your back the pain might become worse. Chills, fever, or both can also be expected. A fever with acute pancreatitis could hit 100 to 101 F. Additional symptoms that could accompany a fever include profuse sweating, high or low blood pressure, a lethargic feeling and a loss of consciousness. Nausea and vomiting are common symptoms of pancreatitis. A fever and pain could result in a rapid heartbeat. A distended abdomen that is sensitive could also occur. Diabetes and high blood sugar – Around a third of people with chronic pancreatitis will end up as a diabetic. Symptoms of diabetes include an increase in appetite, thirst and urination. If you develop diabetes while you have chronic pancreatitis, it could become complicated because the production of insulin is affected by damaged cells. Pain – Thisis not a given symptom with chronic pancreatitis, some people experience it and others do not. If the patient feels extreme pain that gets worse and then stops it could mean that the pancreas is no longer working. Jaundice – A yellowish cast to the skin and whites of the eyes could mean jaundice, which is common in people with pancreatitis. It is the result of the bile duct becoming blocked and is unable to get into the bloodstream. Bowel movement changes – Steatorrhea is a condition where the stools are foul and greasy. It is a result of the food not being absorbed by the body because it is not breaking down correctly. Loss of weight – While this occurs in both types of pancreatitis, it is temporary in acute and slowly in chronic. In acute pancreatitis it is the result of the nausea vomiting and pain that comes with the disease. Weight loss in chronic pancreatic is much slower and spans months and years because of food absorption problems. Pain after eating – Most people who have pancreatitis have found that eating duringpancreatitis attack will worsen the pain. One has to stop eating for hours or days till the pain subsides. Immediate medical intervention is required for pain relief. If you are suffering from pain in your abdomen, you should set up an appointment with your physician. If the pain is severe enough that you cannot sit or find a comfortable position,you need to get medical help immediately. Knowing the symptoms of pancreatitis is not enough; you also need to learn something about the treatments to find relief. Treatment for acute pancreatitis starts with IV fluids while in the hospital. Pain medications are administered and no food is given for several days until the inflammation in the pancreas has subsided. Clear liquids and a bland diet are next until you can eat normally again. If the patient’s pancreatitis is serious, they may have to go to the intensive care unit (ICU). A constant watch is in place to avoid complications to their kidneys, lungs heart and damage to the pancreatic tissue. If the pancreatitis has been caused by gallstones, the gallbladder might have to be removed. The pancreas can return to normal as soon as the gallstones have been removed. Patients with chronic pancreatitis are in for different treatment procedures. This disease is harder to treat and begins with the doctor working on relieving the pain involved and taking care of the nutritional issues. Managing the pain. Pain in the abdomen can be severe and without any reprieve. Pain medication may be dispensed but in severe cases a surgical procedure to block the nerves that the pancreas uses to signal the brain is required to relieve symptoms of pancreatitis. Nutritional issues. Enzyme supplements that work to aid in processing the foods are given to patients. Dietary changes. A consultation with a dietician can help patients develop a plan for a low-fat diet that has a high nutritional value. Surgery may be ordered as a last resort to help alleviate pain in the abdomen, replenish the hormones and enzymes that have been drained from the pancreas, reduce the number of attacks, and treat the disease if it is because the pancreatic duct has been blocked.